Slides provides a step­-by-­step way for you tell a story about your product in an attractive way. Here’s how it works: find slides you like, pick the panels you need, customize your navigation and choose an animation between slides that you like. Export the template and you are ready to work with your content! We built it simple using clean HTML, CSS and jQuery. With clean, logical and reliable code you can upload finished Slides to your website or with your hosting and it will work. And with no limitations on export, you can use it for as many products as you want. 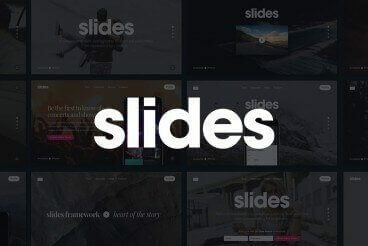 Slides contains 60 beautiful slides and 11 quick­start templates that you can combine. It was born to help you to create a beautiful form for the story you want to tell. Every slide is available in PSD, Sketch and HTML formats, and you can take a look at plenty of examples on the Slides demo site. Entering the competition is easy. All you need to do is to head over to our Facebook page, and leave a comment on our competition post. After the contest closes, we’ll randomly pick three winners from the comments! The contest closes at midnight GMT on the 25th November, and we’ll contact the winners on Facebook to ask for your email address.